This dish is perfect for autumn brunches or slow mornings and according to feedback “perfect for morning afters”. Kale is super healthy and tasty when fried with garlic in olive oil and seasoned with salt. Serve with eggs and bread so you will have a proper breakfast. Peel and chop garlic and fry with olive oil in a pan (mild to medium heat). In the meanwhile chop kale and when chopped add to pan and fry about 5 minutes until a bit softened. Season with salt and pepper. 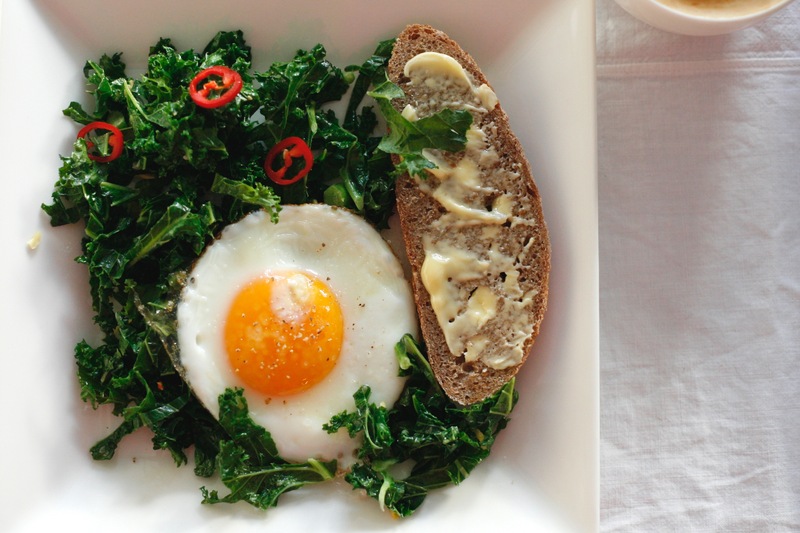 Fry eggs in a sunny side up style while kale is getting ready. Sprinkle salt and white pepper on top. Chop chilli. Place fried kale to plates and place egg on top. Sprinkle chopped chillies on top. Serve with fresh bread.